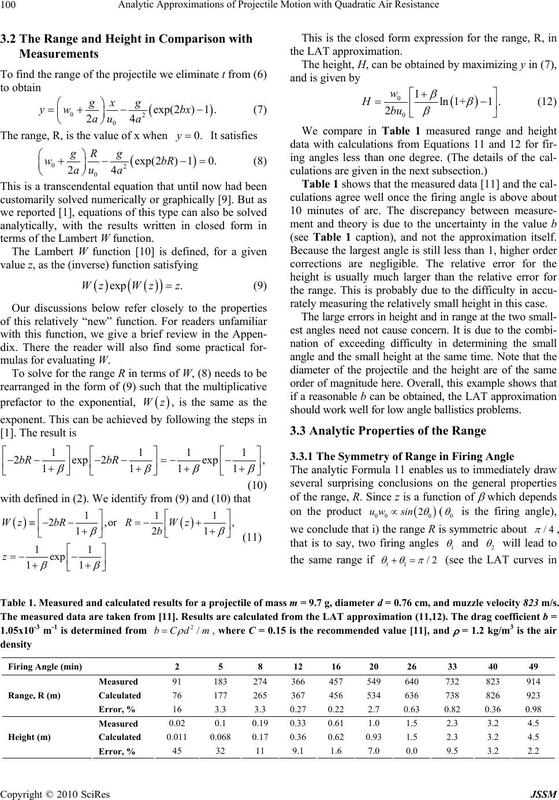 Received November 6th, 2009; revised December 11th, 2009; accepted January 18th, 2010.
tical formulas for accurate evaluations of the Lambert W function. for the range in terms of the Lambert W function . quadratic in speed, the more realistic case in practice. where b is the drag coefficient with the dimensions m-1. sary to solve (1) analytically. erage much greater than the vertical velocity, uw. 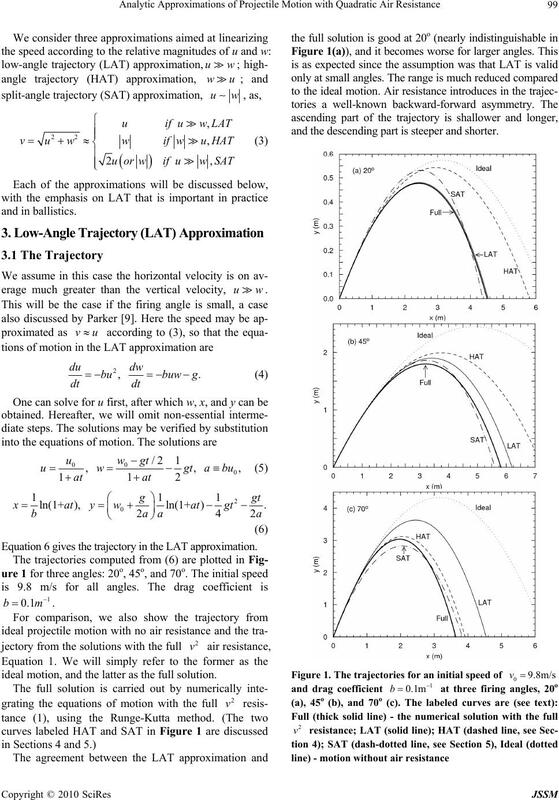 Equation 6 gives the trajectory in t he LAT approximation. ideal motion, and the latter as the fu ll solution. and the descending part is steeper and shorter. 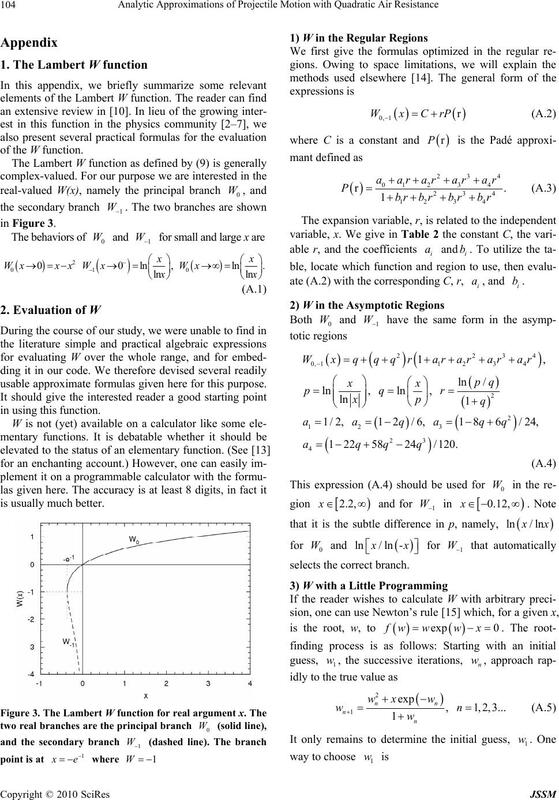 terms of the Lambert W function. (see Table 1 caption), and not the approximation itself. rately measuring the relatively small height in this case. should work well for low angle ballistics problems. Table 1. 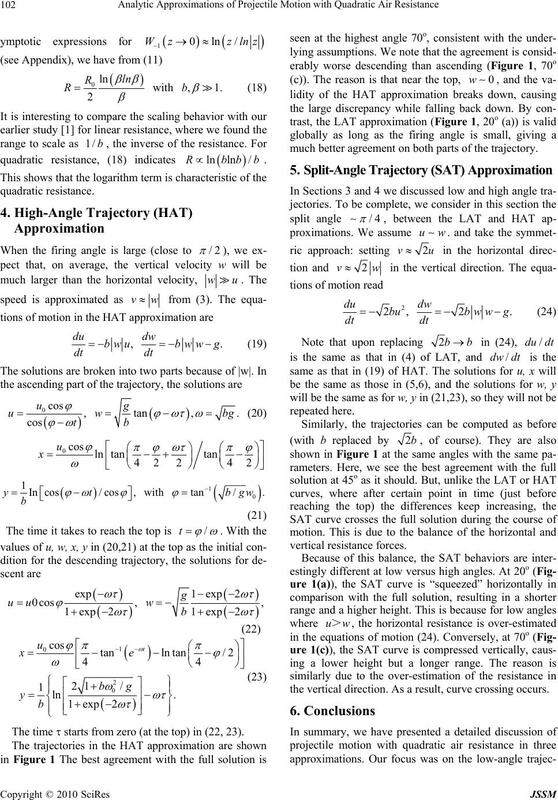 Measured and calculated results for a projectile of mass m = 9.7 g, diameter d = 0.76 cm, and muzzle velocity 823 m/ s.
ideal projectile motion without air resistance. , a fact that is well known. duced, by about 40% for this particular set of parameters. metric range is a result of the balance between T and u. The time  starts from zero (at the top) in (22, 23). much better agreement on both parts of the trajectory. the vertical direction. As a result, curve crossing occurs. nadian Journal of Physics, Vol. 78, pp. 823–830, 2000. 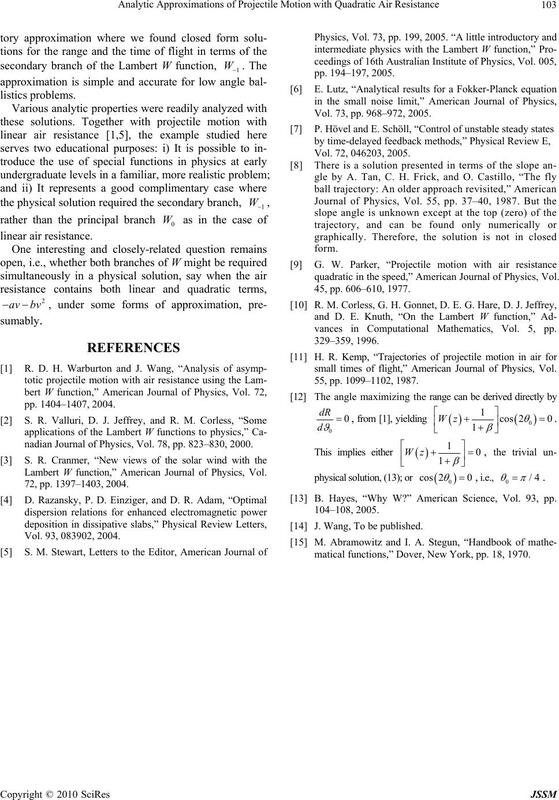 Lambert W function,” American Journal of Physics, Vol. Vol. 73, pp. 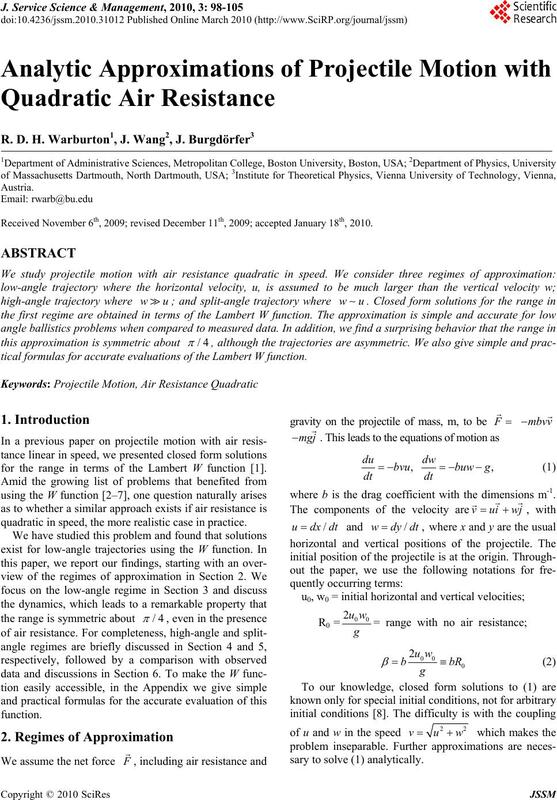 968–972, 2005.
quadratic in the speed,” American Journal of Physics, Vol. vances in Computational Mathematics, Vol. 5, pp. 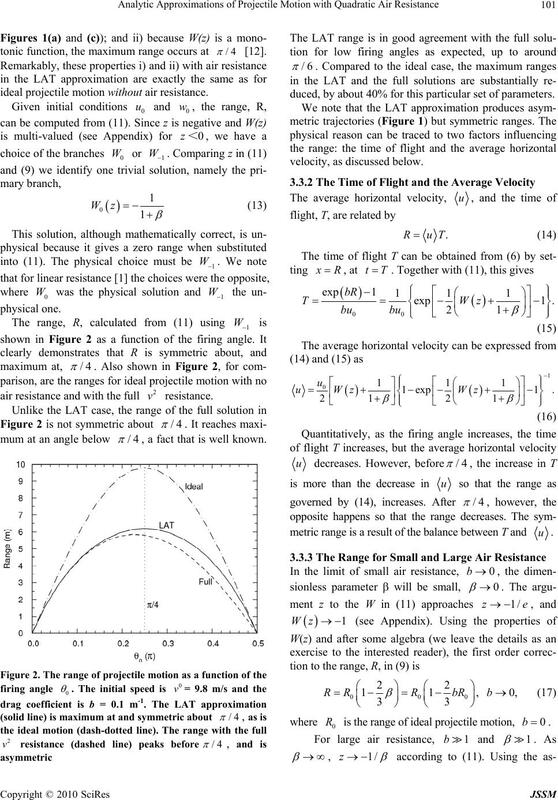 small times of flight,” American Journal of Physics, Vol. B. Hayes, “Why W?” American Science, Vol. 93, pp. J. Wang, To be published. matical functions,” Dover, New York, pp. 18, 1970.
usable approximate formulas given here for this purpose.